KVPY Admit Card 2019 - IISc Bangalore will release the admit card of KVPY for the aptitude test in the second week of October, 2019 in the online mode. Candidates who applied for the KVPY fellowships and whose application are accepted will be able to find and download their KVPY 2019 admit card using their User ID and Password in the login window. KVPY hall ticket 2019 will mention important details like the candidate’s name, roll number, examination centre and address etc. Candidates must remember to carry the admit card of KVPY 2019 on the exam day as no candidate will be allowed to sit for the exam without it. KVPY exam is scheduled to be conducted on November 3, 2019 in the online mode for all the three streams - SA, SX and SB. Candidates who qualify the KVPY 2019 aptitude test will be called for the interview round in January/February. The KVPY 2019 admit card for interviews will be out in January 2020. Read the complete article below to know more about KVPY hall ticket, steps to download it, detail it shares and more. Listed in the table below are the important dates related to KVPY admit card 2019. One must note them down and check them regularly to stay updated on any official announcement. Listed below are the steps to download the admit card. Candidates must remember that the admit card will be released online only. IISc Bangalore will not send the admit card of KVPY 2019 to candidates in the offline mode. What if you’re unable to download the KVPY Hall Ticket 2019? 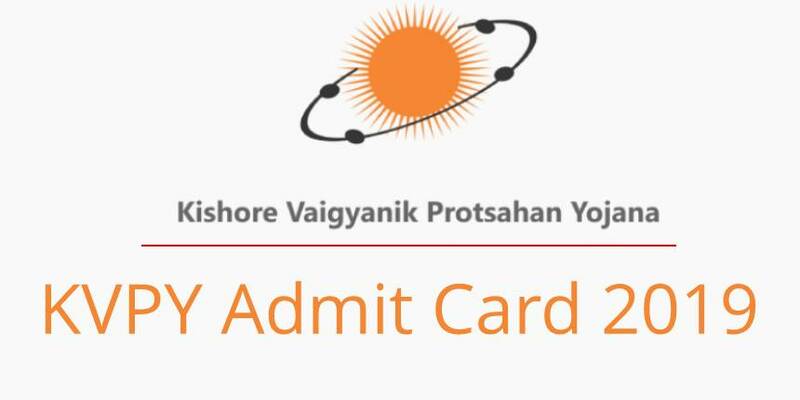 There might be instances where one is unable to download his/her admit card of KVPY 2019. Let’s read what can be the causes for the same and how to overcome them. What if I forgot KVPY User ID and password? The new User ID and Password will be sent to the registered mail id and mobile number. Note: If you still find some problem you must contact the KVPY officials via mail. How do I download my KVPY admit card 2019 if there is low internet speed? There can be times when candidates are unable to download admit cards because of low speed of internet. In such a case, they should try logging into the website later and try to download the admit card. What if my application form is not accepted? Candidates who’s KVPY application form is not submitted/accepted successfully will not be issued their KVPY admit card. The form might get rejected due to wrong information filled in or in case where candidates does not fulfill the eligibility criteria. Although such a situation is rare, students are advised to go through the KVPY eligibility criteria properly before applying for the exam. What does KVPY 2019 Admit Card mention? The fields listed on KVPY 2019 admit card have been provided below. Candidates must read the instructions carefully and abide by them so as to reach the examination centre fully prepared. What if there are mistakes in the KVPY Admit Card? Email ID: [email protected] for application related queries and [email protected] for fellowship related queries. What not to carry at the exam hall of KVPY 2019? It is important that candidates download, practice and analyze the KVPY sample papers/ previous year question papers to qualify the exam. It not only helps in the understanding of exam pattern but also helps to know the weak areas where one needs to work on. One must begin solving the KVPY question papers after finishing the syllabus once. Mock tests enables one to experience the actual exam environment as well as provides hands-on with a computer-based test. They are very beneficial as they create real exam like environment and demands candidates to answer the questions within the stipulated time. After giving the mock test, candidates can know their rank from amongst the candidates who have attempted the same. IISc Bangalore will announce the KVPY result 2019 for aptitude test in the second week of October in the online mode. The KVPY result 2019 is released in the form of merit list which contains the names and roll numbers of the shortlisted candidates who qualify for the round of interview. This roll number shall be same as mentioned on the KVPY hall ticket 2019. Along with the KVPY result, IISc Bangalore also declared the qualifying cut off marks for the aptitude test. IISc will release the KVPY 2019 cut off for aptitude test along with the result. The cutoff are the minimum marks a candidate needs to achieve in order to qualify for the round of interview. A second and final cutoff is released by IISc after the conduct of interview. Those who qualify the round of interview are awarded the KVPY fellowship.